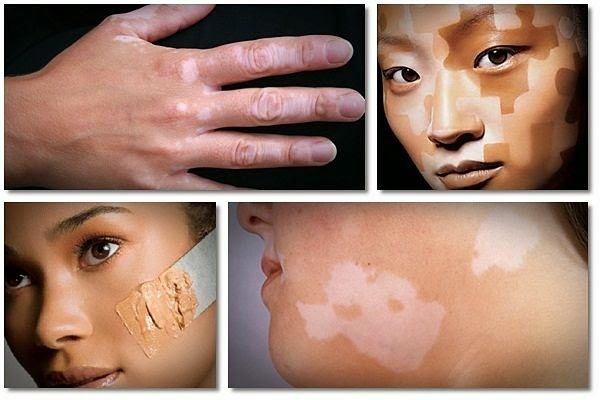 Natural Vitiligo Treatment : What is Vitiligo and How is it Treated ? What is Vitiligo and How is it Treated ? In vitiligo, the cells responsible for giving the skin's its color (the melanocytes) are destroyed, hence the appearance of white patches. There may be several factors that can cause these cells to be destroyed, and sometimes the exact cause is unknown. It is believed that vitiligo may be an autoimmune disease, which causes the immune system to start attacking the melanocytes. It can also arise due to a disorder in the melanocytes themselves, causing them to trigger pathways that result in 'cell suicide'. Some researchers also believe that sunburn and chronic stress can cause vitiligo. The main symptoms of vitiligo are white patches on the skin. These patches often spread and become larger with time. The rate of spreading is highly variable - some people report very quick spreading while in others they spread slowly over several years. These patches tend to be found mostly on the areas that are exposed to the sun, such as the hands, feet, face and around the lips. However, they are also commonly found in the armpits and groin, at the navel, in the genital area, and at the nostrils. In addition, people with vitiligo often suffer from early graying of the hair. White patches of skin are tell-tale signs of vitiligo, but there are other factors that confirm this diagnosis. These include whether the patient has a parent who suffers from vitiligo, whether autoimmune diseases run in the family, and whether the patient experienced grey hair before the age of 35. Sometimes, a biopsy and a blood test will be used to rule out other medical conditions. Treatment for vitiligo is still a highly-researched and changing area. Treatment will depend on the extent of the condition, and also how much the patient can afford, as many treatments tend to be very expensive. In addition, even the most specialized treatments are not always effective and are associated with a number of side effects. Usually, one of the first treatment options recommended is steroid therapy and/or immunomodulators. However, both these pharmaceutical treatments can only be used in the short term and are notoriously ineffective and suffer from a high incidence of side effects. Another treatment option involves the use of ultraviolet light coupled with medications. However, this involves bi- or tri- weekly visits to a specialized clinic for weeks or months, is very expensive, and side effects include eye damage and an increased risk of skin cancer. Yet another treatment option involves surgical skin grafting, but sometimes this causes skin trauma that ends up aggravating vitiligo even more. For very small patches of white skin, tattoos are sometimes used to cover these up. It is interesting to note that as early as the 1980's, medical researchers had reported that they cured people of vitiligo using herbal extracts, mega doses of vitamins or a combination of herbs and vitamins. Several such reports were also published in the 1990s; for example, there was a group of Swedish doctors who cured patients of their vitiligo in just 3 weeks using only vitamin supplementation. However, nowadays such research has been hidden both from the general public and from the scientific community itself. This is because there is too much money involved in the more expensive treatments, and indeed vitiligo accounts for a large chunk of the pharmaceutical and medical industry's annual revenue. Doctors who know about the natural cures for vitiligo will not mention it as doing so will cause them to miss out on thousands of dollars from each patient. Worse, young doctors may never know about the natural alternative, as this research has been removed from all modern medical textbooks. Due to the pharmaceutical and medical industry's wide-reaching influence and the money involved for all health professionals who deal with vitiligo, very few are willing to publicize findings that vitiligo can indeed be treated naturally, safely, extremely cheaply and in just a few weeks. One of these few medical researchers who dares to go against the current is David Platrow, a UK-based researcher and certified nutritionist who is doing a lot of work to try to make these findings available to the general public. 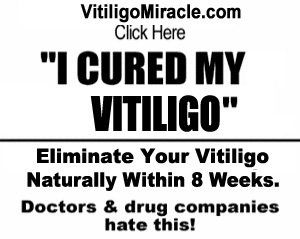 He is the creator of the " Vitiligo Miracle™" (www.vitiligomiracle.com), a step-by-step guide to self-curing vitiligo holistically using an amalgamation of all the research done in the area together with his own research and self-experimentation. Anti vitiligo herbal oil is natural organics base formula for permanent vitiligo spots recovery without any side effects .it is most effective organics remedy for all type of skin like sensitive dry oily and both gender can apply. Cassia tora are common natural herbs that are used in refining/manufacturing of anti Vitiligo Natural products. Combination of these herbs in specific ratio under particular process is proven incredibly useful for vitiligo patients. Very nice post share: One of the natural Herbal Treatment for Vitiligo that will assist you to efficiently decrease white patches to grow on your skin is the use of turmeric and mustard oil.